Can you guess who this card was made for? The 5, 6, 7, 8 might give it away since it goes along with counting dance steps. :) If you guessed it was given to one of Alexa's dance teachers, then you guessed correctly! I couldn't resist prettying up the circles on the patterned paper with a mix of chipboard, enamel shapes, buttons and even a silver charm. One teacher joked that she wasn't going to open her card this year if it wasn't handmade. She has saved every card I've ever made her over the past 10 years! She is going to LOVE that card. Its everything dance should be. Vibrant and fun. Loveeeeeeeeeeee this! LOVING the circles and the 5 6 7 8!!!!!!!!!! This is gorgeous, Lisa, and I'm sure it will be a lovely addition to the past cards you've made her! 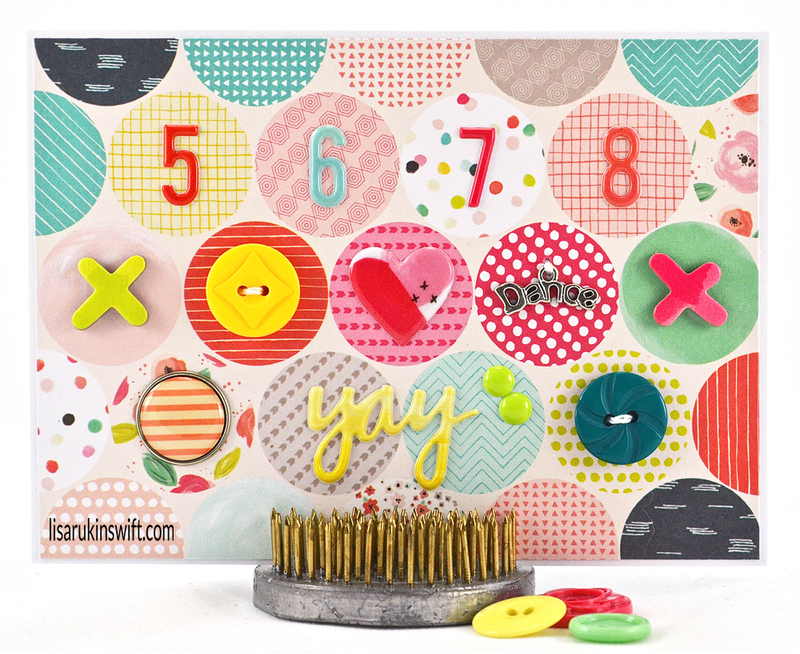 Such a fun card Lisa, love the circles and the count is such a creative sentiment. This is incredible - I LOVE this card!! That paper is cute and you have taken it up a notch with all the fun details you have added in!! You are amazing and my favorite detail is the silver dance charm - so unique!! Fabulous dance card!! LOVE all the circles and the details! !